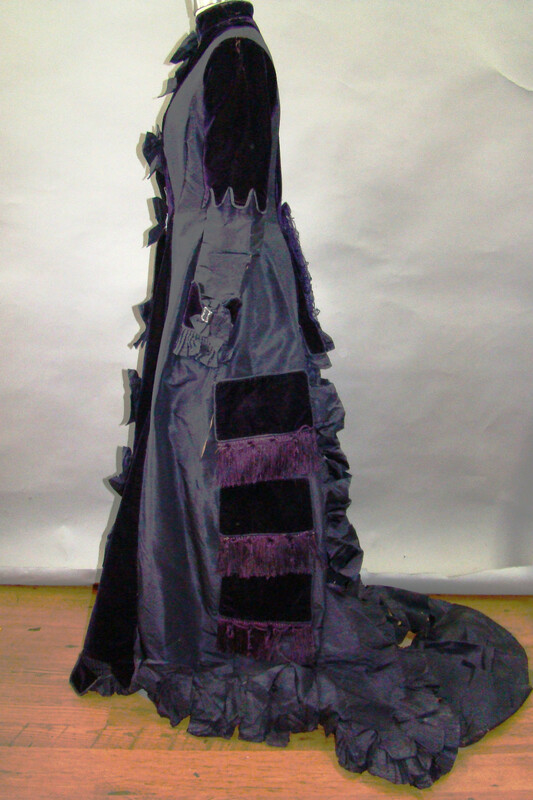 From about 1876 to 1879 the Princess seamed dress with bustle and fishtail train was popular. 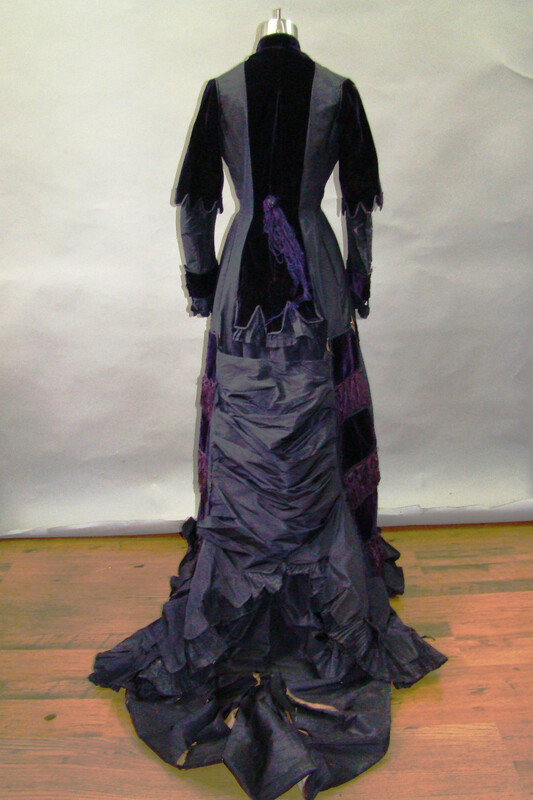 This dress is a relatively rare example as it is a little more common to find two piece dresses from this period. 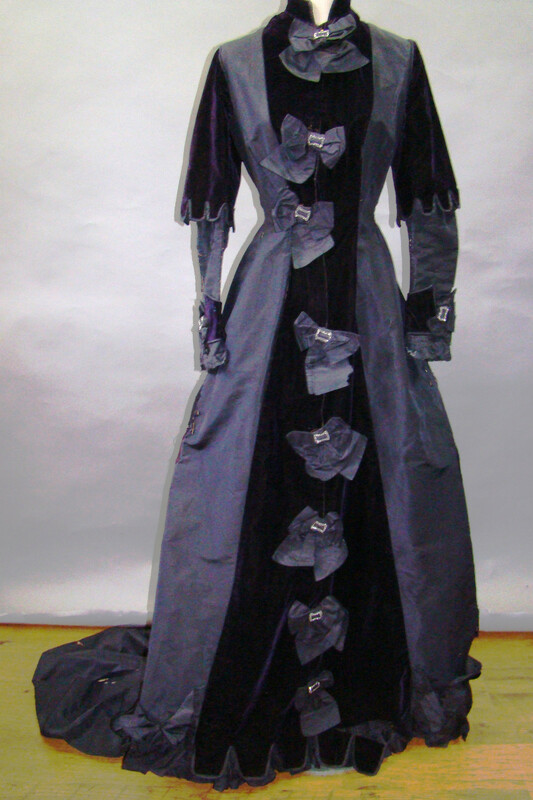 This dress is made of navy blue silk taffeta and velvet, trimmed with bows and cut steel buckles. 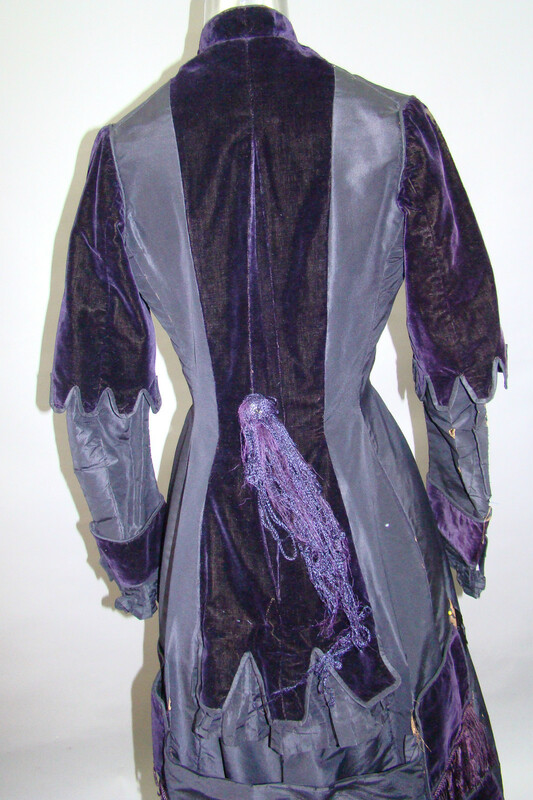 The oversleeves, the back of the bodice and the bottom of the front are trimmed with large satin bound velvet scallops. Under these scallops is closely pleated taffeta trim. 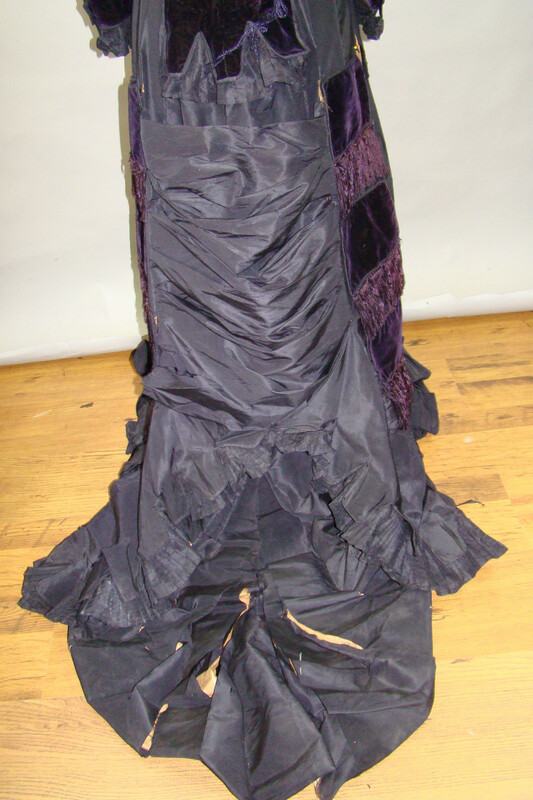 There is also large pleated taffeta trim around the sides of the bottom of the skirt. 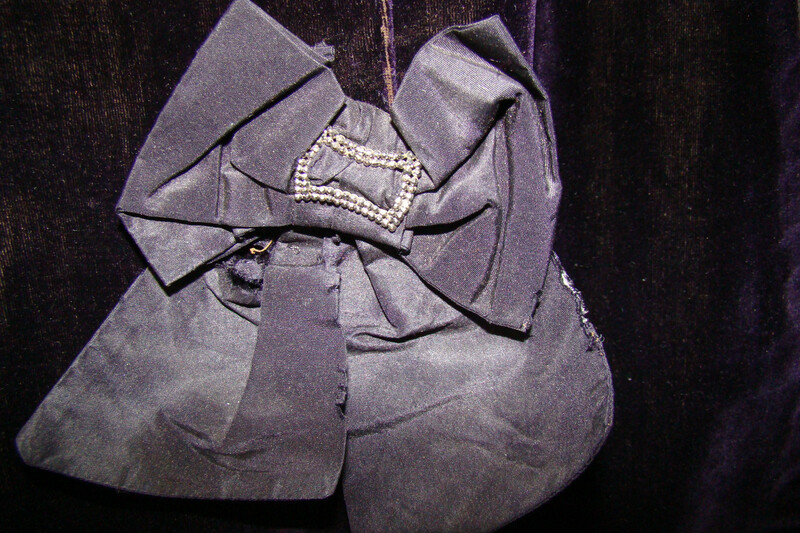 There are 8 bows with cut steel buckles down the front and two more trimming the sleeves. The buckles shine like rhinestones but are cut steel. It is extremely rare to find this many cut steel matching buckles. The buckles do not have tongues. The dress opens part way down the front and closes with hooks and eyes. 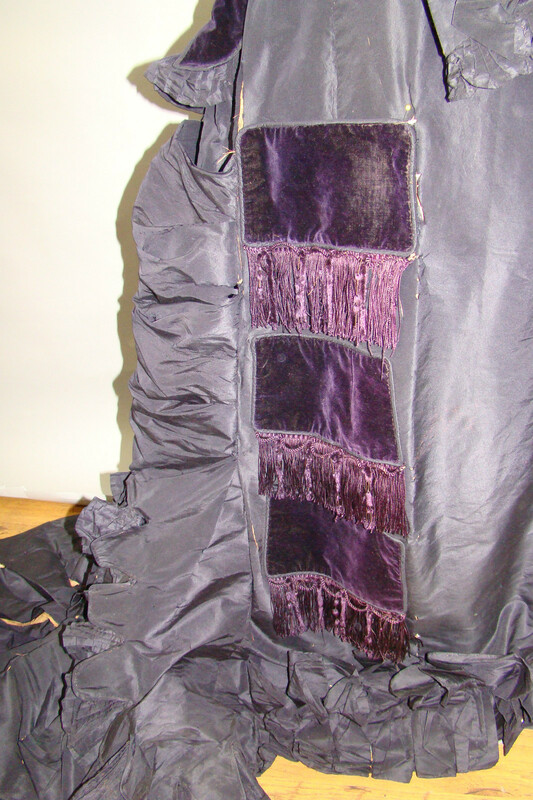 The skirt sides are trimmed with three square of velvet, chainette fringe, chenille fringe, and cording. The dress has a velvet standing collar and velvet cuffs and pleated trim on the sleeves. An interesting feature is the wide piping at the armholes, collar, and cuffs. The bustle is applied over the dress. 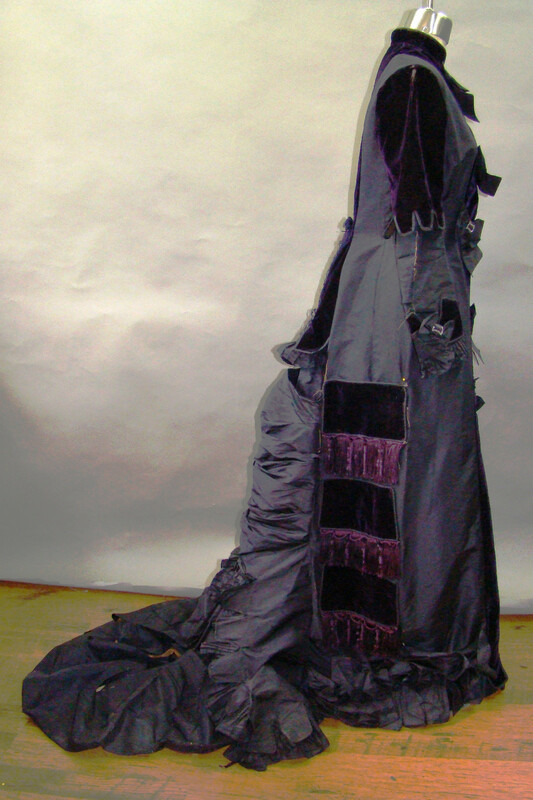 The bustle is cut away at the bottom with more scallops and pleated trim underneath. The fishtail train is pleated into the back seam of the dress at the bottom. The only non period change to the dress is the back of the bodice center back seam as been let out and a non period button with shaggy thread and cord trim has been added to cover a hole caused by the alteration. There are splits and tears throughout the fabric and the nap has been worn off the velvet in places. 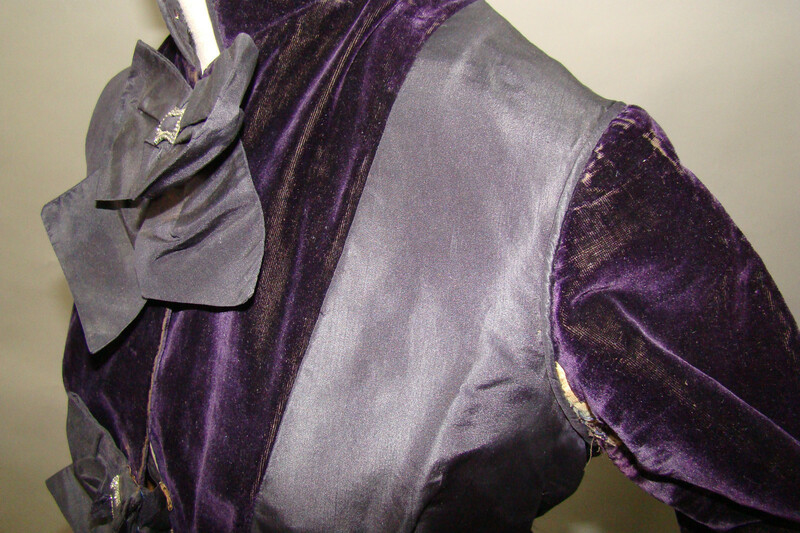 Photo 6 shows how the velvet has split at the bottom of the front. The worst damage is to the train which is splitting along the folds of the pleats. The train was stabilized by a previous owner. This addition is visible at the bottom of photo 11 but, at this point, isn't doing much good. 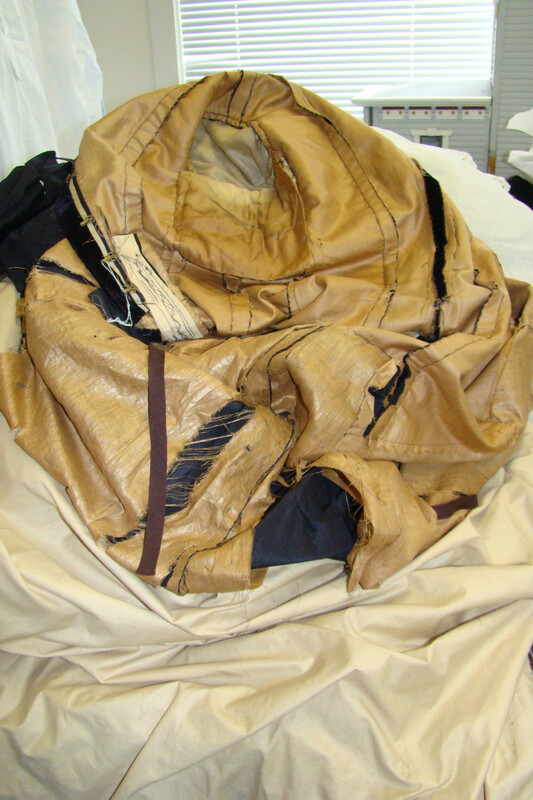 The inside of the dress is lined with polished cotton which is also breaking and splitting. This dress is a show stopper as far as display but can't be worn without extensive damage. Just handling it causes damage. It is a very small size with a bust of 34 and waist of 27, approximately. This dress is an excellent example of a short-lived, eye popping fashion style for the collector or student of fashion. Any questions, please ask. Thanks for looking!